As a device, the Asus Zephyrus represents a curious fusion in the world of gaming computers. It’s an ultra-thin, remarkably portable laptop that nonetheless packs in highly capable components that would be welcome and expected on a desktop computer. Indeed, that portability is a direct result of computer hardware manufacturer Nvidia’s Max-Q design philosophy, which aims to maximize GPU performance while maintaining thinness and lightness. 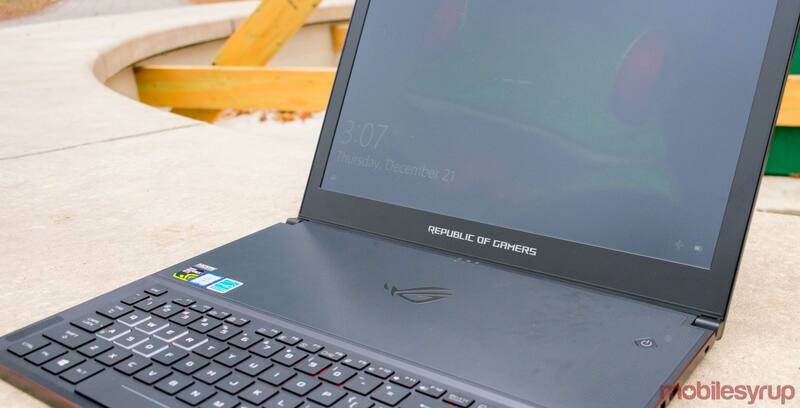 However, in order to accomplish the performance-intensive task of pumping out a quality gaming experience, the Zephyrus ultimately fails to truly cross the border into the realm of the laptop. 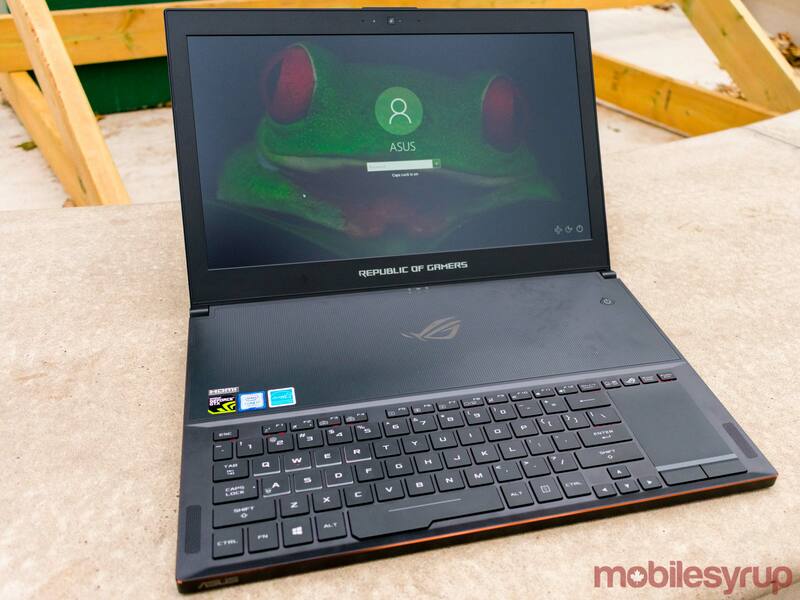 All of which is to say that you can fit this computer into a backpack or messenger bag, but when it comes to actually using this Asus device, a desk is very much required. Still, as far as gaming laptops go, there is no denying that Asus has a winner-of-sorts on its hands. Depending on where you purchase this computer, you’ll have your pick of two or three different configurations. Still, regardless of whichever Kaby Lake processor you end up settling on, or however much SSD storage you gravitate towards, one thing remains constant: the Zephyrus packs in an Nvidia GeForce GTX 1080 graphics card with 8GB of dedicated DDR5 VRAM into a frame that is 17.9mm thick and a device that only weighs 2.24 kilograms. The device’s weight is made impressive by the fact that it’s so thin, because given its thinness, one would expect the Zephyrus to require an intense cooling system to ensure that the GTX 1080 card doesn’t cause the computer’s chassis to completely liquify during peak load. To mitigate any potential overheating problem, Asus built in a cutting-edge cooling system to maintain the Zephyrus’s temperature. Packed into the device’s undeniably thin frame are fan blades forged out of a liquid-crystal polymer that is reportedly stiffer — as well as 33 percent thinner — than conventional blades, leading to a configuration that sports 71 blades per fan. Special fan blades notwithstanding, the truth of the matter is that the Zephyrus is able to draw in more air to cool its internal components because the device’s hinge quite literally opens up the chassis, allowing the computer to draw in the required air to prevent the aforementioned liquefaction. This audacious hinge design ensures that the device doesn’t act as a giant heat sink, but it’s also this design choice that speaks to Nvidia’s Max-Q philosophy. In aerospace engineering, Max Q refers to the maximum dynamic pressure that can be applied to an aerospace vehicle before it collapses under the stress. 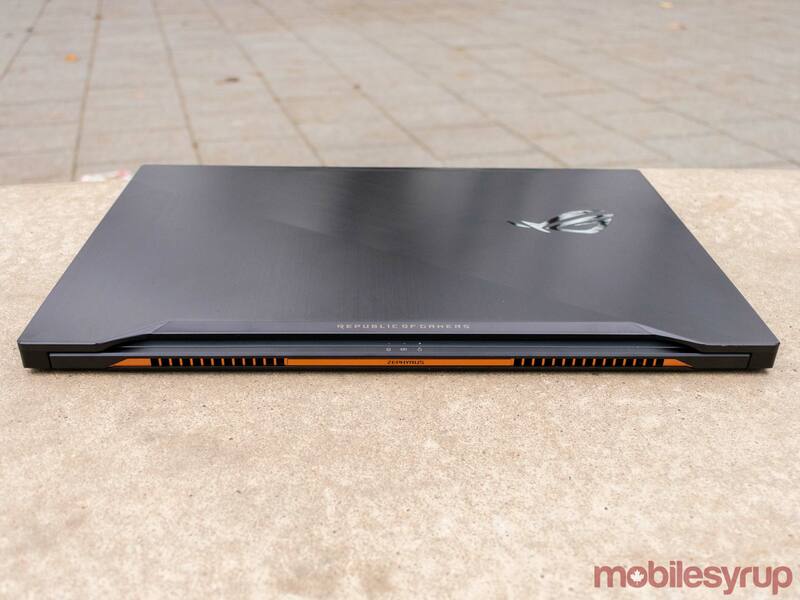 Nvidia’s goal with its own interpretation of Max-Q is to push the boundaries of gaming laptops by encouraging device manufacturers to build gaming laptops that are as thin as conventional laptops, without sacrificing any of the power typically associated with gaming machines. Building such a device requires quite a bit of insight and ingenuity, and for the most part, Asus has succeeded at building such a finely balanced machine. 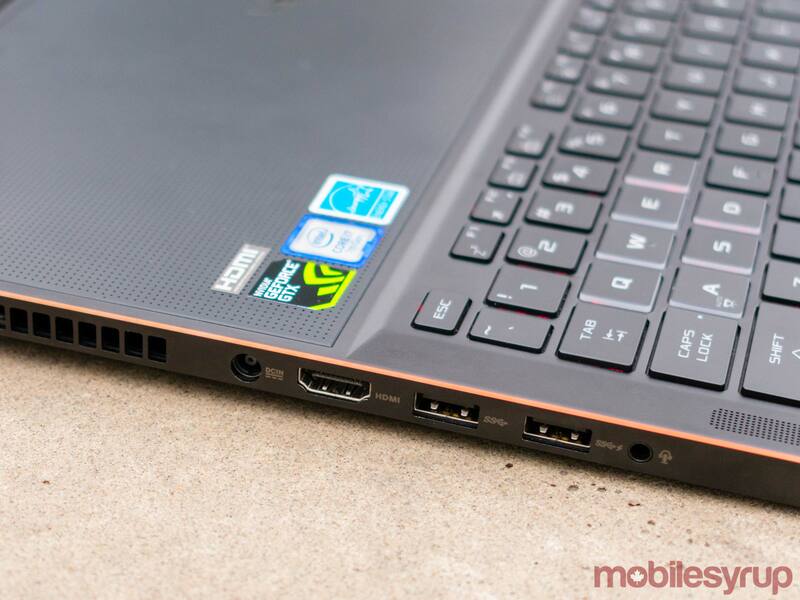 However, the decision to incorporate such an audacious hinge design into the Asus Zephyrus means that the computer is spectacularly unstable when used on anything other than a flat surface. When placed on a person’s lap, the Zephyrus quite literally always feels like it’s a few deep breaths away from falling over. It’s a fascinating sensation that means that the computer is only really comfortable when used on a flat surface like a table or a desk. Once users do place the computer on that flat surface, the Zephyrus proves to be incredibly capable. One would expect nothing less from a device named after the Greek god of the west wind. The device easily plays graphics-intensive games like Overwatch on max settings — as well as games like The Witcher 3 on most higher settings — zooms through most of the programs in the Adobe suite, and, of course, can put Google Chrome through its paces. 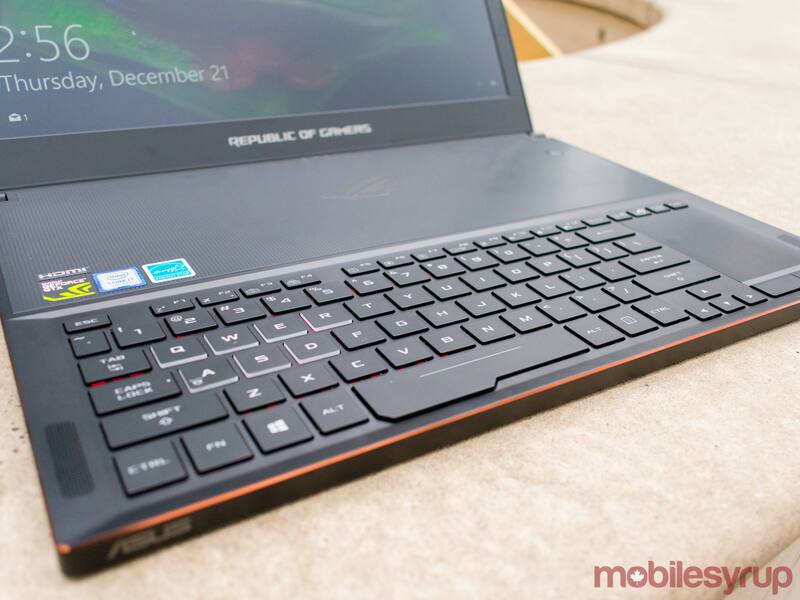 However, you’re not going to want to use the Zephyrus’s built-in keyboard or trackpad to play games or get any work done. The backlit, chiclet keyboard is annoyingly shallow, and while the Windows Precision Trackpad is certainly one of the better laptop trackpads on the market, it’s still uncomfortable to use and far less precise than a hardware mouse. The keyboard’s and trackpad’s placement along the edge of the computer also drew my ire. 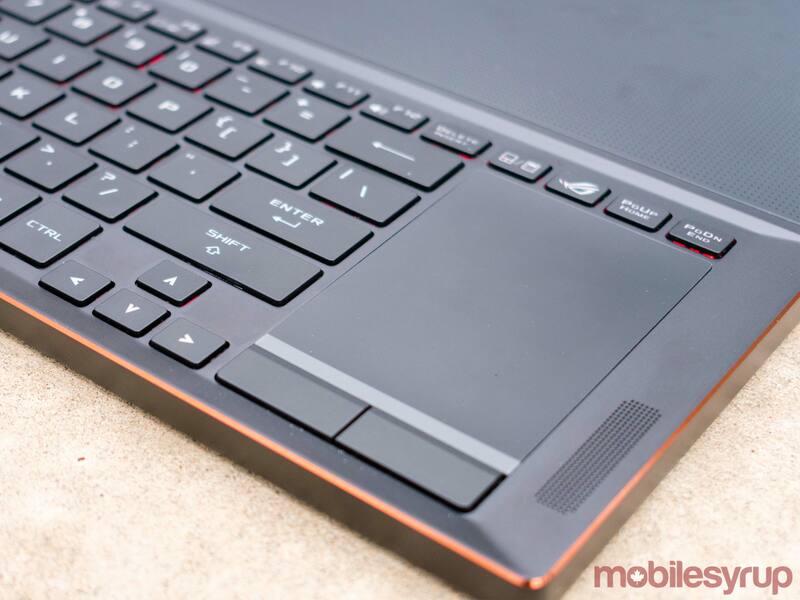 Those unfamiliar with gaming laptops might be surprised to see the trackpad placed directly horizontal to the keyboard. This isn’t a completely strange set up, and speaks to the fact that most of us use a keyboard and mouse next to each other. It takes a some getting used to, but it’s not a set up that is completely objectionable. However, the keyboard’s and trackpad’s placement along the edge of the laptop means that there’s no palmrest for one’s hands. It’s an uncomfortable position for one’s hands, and I personally was not drawn to the design. 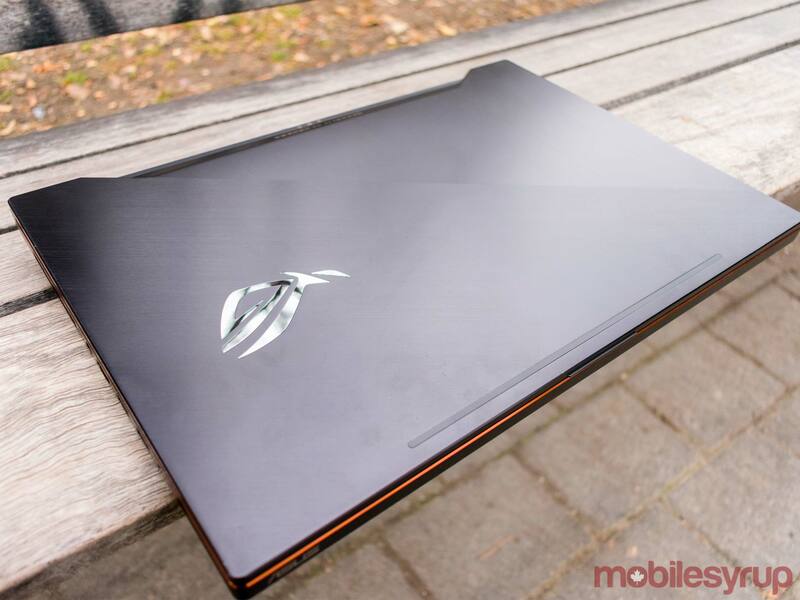 For all the praise that one can afford this computer, and make no mistake this is a praise-worthy device, the Asus Zephyrus still isn’t necessarily worth its $3,499 CAD price tag. The Zephyrus is an ultra-thin laptop that closely resembles an ultrabook, but it’s not really an ultrabook — it’s a desktop-class machine packed into a portable frame. As a quasi-chimera of two different form factors, the device ends up lacking certain features that are standard on both desktops and laptops. Take, for instance, the Zephyrus’s lack of SD card port. It’s a baffling omission, especially since the device features four USB 3.1 ports, a Thunderbolt 3 USB-C port, an HDMI port, as well as a headphone jack. Then there’s the problem of the battery. Even when used as nothing more than a Chrome machine — used literally for nothing more than light web browsing and the occasional Google Doc — the Asus Zephyrus is unable to last for longer than two hours. As one can imagine, there’s almost no point in gaming on this computer without plugging in a power brick. Complaining about battery life might seem strange or unfair, especially since all modern gaming laptops are unable to chug out battery life matching something like a MacBook Air or Dell XPS 13, but the fact remains that the Asus Zephyrus can only be called portable because it’s lightweight and fits in a backpack. Ultimately, it’s not really fair to call a computer portable if it can’t last longer than a few hours before a user needs to scramble to find a power outlet. How do you solve a problem like expensive pre-built gaming rigs? Once one acknowledges the laptop-desktop dichotomy, the Zephyrus’s price becomes a point of major contention. At $3,499 CAD (slightly cheaper if you capitalize on Canada Computers or Newegg sales), the Zephyrus is more expensive than most conventional gaming desktops and is certainly more expensive than building a similar machine yourself. These facts force any potential Zephyrus owners to ask themselves the age old gaming PC question: Does one really want to spend more money on a pre-built rig, or would one rather just build a gaming PC on their own? However, if you do choose to buy the Asus Zephyrus, you’ll be rewarded with a highly capable machine with a fascinating design that is simultaneously confounding and astonishing -- as well as a computer that will dutifully deliver on almost any task you ask of it. 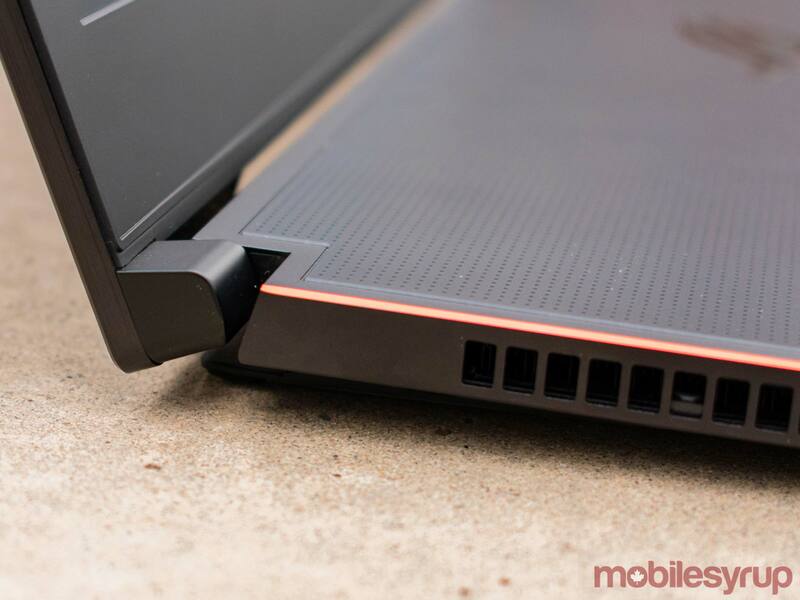 "A supremely capable gaming laptop that is nonetheless hindered by the fact that it is yet another costly pre-built rig."